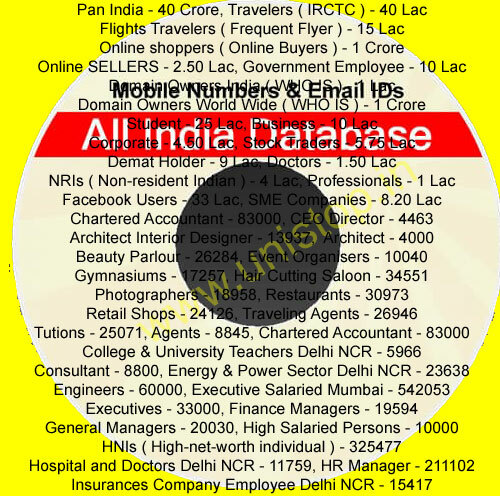 Unistop.in :: All India Mobile & Email Database Rs.1999 only. All India Mobile & Email Database. Database Type : Email Databases and Mobile Number Databases. Last Updated : 2015, 2016 & 2017. Fields : Name, Email, Mobile Number, Address, category, etc. Segregated : Segregated by City Wise, State Wise, Category Wise. Sales Manager - 60256 It will cover email and mobile number database. It contains 90,00,00,000 email and mobile number, 400+ Cities, 27 State & 40 + Categories.